Is UN Planning to Replace Humans with Machines & Robots? UNITED NATIONS, Feb 11 (IPS) - The United Nations -- once facetiously described as an institution whose bloated bureaucracy moves at the leisured pace of a paralytic snail -- is steadily zooming into the field of fast-paced, cutting-edge digital technology where humans may one day be replaced with machines and robots. Is this a glimpse into a distant future or a far-fetched fantasy? The technological innovations currently being experimented at the UN include artificial intelligence (AI), machine-learning, e-translations (involving the UN's six official languages where machines are taking over from humans) and robotics. The United Nations says it has also been using unarmed and unmanned aerial vehicles (UAVs), or drones, in peacekeeping operations, "helping to improve our situational awareness and to strengthen our ability to protect civilians". 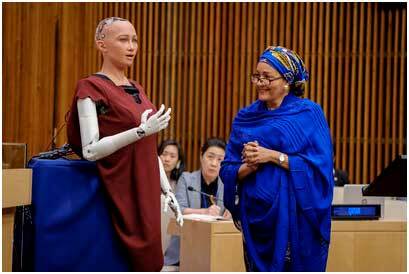 At a joint meeting of the UN's Economic and Social Council (ECOSOC) and its Economic and Social Committee, a robot named Sophia had an interactive session last year with Deputy Secretary-General Amina J. Mohammed. Among the technological innovations being introduced in the world body, and specifically in the UN's E-conference services, is the use of eLUNa – Electronic Languages United Nations – "a machine translation interface specifically developed for the translation of UN documents." What distinguishes eLUNa from commercial CAT (Computer-Assisted Translation) tools is that it was developed entirely by the United Nations and is specifically geared towards the needs and working methods of UN language professionals, says the UN. Besides the UN headquarters in New York, the spreading eLUNa network includes the UN Office in Geneva (UNOG), the UN Office in Vienna (UNOV), the UN Office in Nairobi (UNON) and the Economic and Social Commission for Western Asia (ESCWA) based in Beirut. Secretary-General Antonio Guterres says the breakthrough has been brought on by a combination of computing power, robotics, big data and artificial intelligence—even as they generate revolutions in healthcare, transport and manufacturing worldwide. "I am convinced that these new capacities can help lift millions of people out of poverty, achieve the Sustainable Development Goals (SDGs) and enable developing countries to leapfrog into a better future," he predicted last year. Addressing the executive heads of some 31 UN agencies last November, Guterres singled out some of the challenges emanating from global mega trends and technological advancements in four distinct areas — artificial intelligence; cyberspace; biotechnology; and the impact of technological applications on peace and security — "with a view to identifying specific entry points for UN engagement and to determine focus areas where the UN system can add value." He said, he is working with colleagues throughout the entire UN system to determine "how our organization can better harness the benefits and address the risks of new technologies, and how the United Nations itself can make better use of innovation." Christopher Fabian, Principal Adviser in the Office of Global Innovation at the UN's children's agency UNICEF, one of the agencies making headway in AI, told IPS that UNICEF is using Machine Learning and Artificial Intelligence (ML/AI) for both programmatic and operational purposes. Based on the "Principles of Digital Development," (https://digitalprinciples.org/) the organization promotes applications and development of Machine Learning and Artificial Intelligence with equity at their core, whether through fair and open training sets or through discussions on algorithmic equity and information poverty, he added. For example, he pointed out, UNICEF is developing Magic Box (https://www.unicef.org/innovation/Magicbox), a collaborative platform that is made possible through the contributions of private sector partners such as Telefonica, Google, IBM, Amadeus and Red Hat, which share their data and expertise for public good. By harnessing real-time data generated by the private sector, UNICEF can gain critical insights into the needs of vulnerable populations, and make more informed decisions about how to invest its resources to respond to disaster, epidemics and other challenges, said Fabian. In addition, UNICEF, through its Venture Fund, the first financial vehicle of its kind in the United Nations, collaborates with innovators on the ground in UNICEF programme countries to build and test new solutions at the pace required to keep up with the rapidly evolving challenges facing children. The Venture Fund was launched by UNICEF in 2016 -- a $17.9 million investment fund -- applying lessons learned over 8+ years, undertaking the complex work of helping to identify and grow innovations for children. The UNICEF Venture Fund makes $50–100K early stage investments in technologies -- including data science and AI -- for children, developed by UNICEF country offices or companies in UNICEF programme countries. By providing flexible funding to early-stage innovators, it allows UNICEF to quickly assess, fund and grow open-source technology solutions that show potential to positively impact the lives of vulnerable children, declared Fabian. Meanwhile, Guterres said new technologies could enhance the maintenance of peace and security, including disarmament and non-proliferation objectives, by providing new tools and augmenting existing ones. For example, he noted, the use of shared ledger technology such as Blockchain in nuclear safeguards, or machine learning in multilateral disarmament verification -- as the Comprehensive Nuclear-Test-Ban Treaty Organization is pioneering. IPS: What is the upside and downside of automation-- and particularly at UNICEF? Is reaching efficiency a key criterion? Fabian: AI can help UNICEF in several ways -- from deep learning algorithms that can learn underlying patterns in satellite imagery to map every school in the world, to predictive models that can help us prevent the spread of diseases. These type of solutions can help improve the reach and efficiency of programmes in the field as well as optimize the allocation of the scarce resources. However, challenges are many. First, is the lack of quality training sets. Data around the most vulnerable populations is often scarce and inaccurate. As a collective, we need to start putting more resources towards collecting data from the ground, to validate existing records, and to debias these datasets. But what happens once we have diverse, good quality datasets? We still need to keep working together to ensure that the data is used to build fair, inclusive algorithms. At UNICEF, we need to make sure that we are part of the conversations happening globally, so that we can bring the voice of children, in particular the most vulnerable, to the table. As one of the efforts to mitigate these risks, UNICEF is a founding partner of the Partnership on AI to Benefit People and Society – and a member of several Working Groups including the ‘Fair, Transparent and Accountable AI' and the ‘AI, Labor and Economy'-. The partnership was established to study and formulate best practices on AI technologies, to advance the public's understanding of AI and its influences on people and society. IPS: To the best of your knowledge, is UNICEF the only -- or one of the few UN agencies --on the path to digitized, highly-automated operations? Fabian: Initiatives around the use of Big Data, AI, blockchain and other digital innovations are being piloted in several UN agencies and programmes -- and sometimes through joint collaborations among them. In order to promote the sharing of these experiences and learn from each other's successes and failures, UNICEF co-funded, together with the World Food Programme (WFP), the UN Innovation Network (https://www.uninnovation.network) -- an informal, collaborative community of UN innovators interested in sharing their expertise and experience with others to promote and advance innovation within the UN System. Similarly, frontier technologies and digitalization are one of the main priorities of the Secretary General. To strengthen digital cooperation and advance proposals among governments, the private sector, civil society, international organizations, academia, technical community and other relevant stakeholders in the digital space, the High-level Panel for Digital Cooperation was set. IPS: Kai-fu Lee, author of "AI Superpowers" and a longtime tech executive, is quoted by the New York times as saying that AI will eliminate 40 percent of the world's jobs within 15 years? And a report by the World Economic Forum (WEF), which met in Davos last month, has estimated that 1.37 million workers will be displaced by automation in the next decade. What is your prediction for UNICEF? Fabian: According to recent studies, between 75 million and 375 million workers (3 to 14% of the global workforce) will need to switch occupational categories by 2030 if automation happens at a medium-to-rapid rate. Similarly, according to World Economic Forum, 65% of children entering school today, will have jobs that don't exist yet. This means that even though many jobs will disappear, many new ones will be created. However, there is a strong evidence of skills mismatch between young people and employers; young people are not learning the skills they need to get jobs. If we manage to understand the skills necessary for the future of jobs and are able to adjust education systems accordingly, children and youth will be more resilient to automation and better prepared for the future. One of UNICEF's efforts in this front is Information poverty, an initiative that aims at ensuring that every child has access to the right information, opportunity and choice. IPS: Do you think the benefits of AI at UNICEF will eventually spillover -- and leading by example -- into the UN secretariat and other UN agencies? Fabian: Similar to question 3 (vis a vis UN Innovation Network and High Level Panel on Digital Cooperation --http://www.un.org/en/digital-cooperation-panel/). We are working with/through both groups and see support for the benefits of AI (and attention paid to identifying and mitigating risks) growing.